Is the Long-term Survival Rate Improved by Preoperative Irradiation Prior to Whipple's Procedure for Adenocarcinoma of the Pancreatic Head? Objective: To determine whether or not both regional control and long-term survival rate were improved by preoperative irradiation prior to curative pancreatectomy for adenocarcinoma of the pancreatic head. Design: Retrospective study of recorded medical data from 1985 to 1989. Setting: The Center for Adult Diseases, Osaka, one of the major cancer centers in Japan. Patients and Intervention: Fifty-four consecutive patients in whom pancreatic head cancer had been judged to be resectable by preoperative diagnostic techniques. A total of 50 Gy per 10 MeV of x-ray was irradiated preoperatively to the wide field, including the pancreatic head area, in 23 patients (group A) but not in the 31 remaining patients (group B). The background factors before treatment did not differ between these two groups. Outcome Measures: Resectability, postoperative survival, and modes of cancer recurrence. Results: At laparotomy, curative pancreatectomy was possible in 17 patients (74%) in group A and 19 (61%) in group B (not significant). In patients undergoing resection, the 1-year survival rate was 75% in group A and 43% in group B (P<.05). However, 3- and 5-year survival rates were almost the same in both groups (28% vs 32% and 22% vs 26%, respectively). 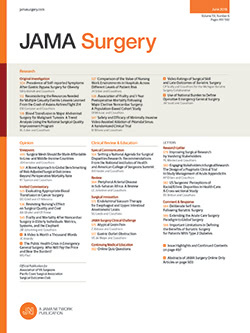 With regard to the cause of death after pancreatectomy, group A had a significantly lower incidence of deaths due to regional recurrence within 1.5 postoperative years compared with group B, whereas deaths due to hepatic metastasis were markedly higher after 1 postoperative year in group A compared with group B.